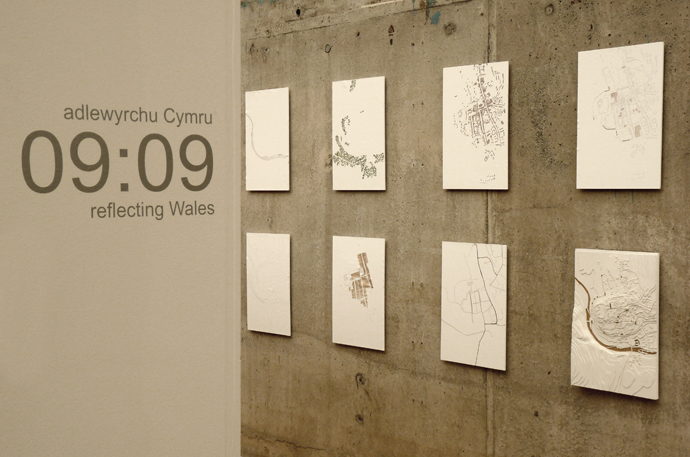 Reflecting Wales 09:09 was a competition led by RSAW, the Welsh School of Architecture and Design Commission for Wales to highlight nine young / emerging architectural designers with the potential to make a significant impact on design standards in our homes, working environments and the quality of places - cities, towns, villages and rural areas - in the decades to come. Matthew's selected manifesto proposed an alternative approach to the planning and design of market towns in Wales. Through and analysis of the structure of place, focal points, weaknesses, routes and edges are sought out and reinforced. Precise, measured and minimal interventions aim to create maximum benefit, consolidating the settlement, enhancing the sense of place and limiting sprawl into the rural hinterland. The resulting exhibition was shown at Howard Gardens Gallery, Cardiff, Ruthin Craft Centre and at the 2012 Welsh National Eisteddfod in Ebbw Vale.